The Massachusetts Clean Energy Center (MassCEC) and Department of Energy Resources (DOER) announced an award of $20 million dollars to support 25 energy storage demonstration projects across the Commonwealth. These projects are aimed at piloting innovative, broadly replicable energy storage use cases/business models with multiple value streams in order to prime Massachusetts for increased commercialization and deployment of storage technologies. The 25 ACES projects represent approximately 32 MW/83 MWh of proposed energy storage in Massachusetts and approximately $31 million of applicant cost share. These numbers compliment the recommended $20 million in awards, for an aggregated value of projects of approximately $51 million. The ACES Program is part of the Baker-Polito Administration’s Energy Storage Initiative (“ESI”). In 2015, the Baker-Polito Administration announced a two-phase, $10 million-dollar Energy Storage Initiative (“ESI”). The ESI aims to advance the energy storage segment of the Massachusetts clean energy industry by expanding storage technology markets, assigning value to storage benefits, accelerating the development of storage technologies, and attracting and supporting energy storage companies throughout the Commonwealth. In the first phase of this initiative, MassCEC partnered with DOER on an energy storage study, State of Charge, to obtain a broad view of energy storage technologies that would inform future policy and programs. In the second phase of this initiative, energy storage demonstration projects were solicited through the ACES RFP with the design of the RFP informed by recommendations from the Study. The RFP aims to fulfill the Administration’s commitment to promote energy storage across the Commonwealth. The ACES RFP (PDF) was released on March 9th, 2017, and closed on June 9th, 2017. The RFP design was based off recommendations from the State of Charge study. Successful applicants proposed projects that will showcase examples of future storage deployment in Massachusetts, help to grow the state’s energy storage economy, and contribute to Massachusetts’ continued clean energy innovation leadership. Additional information about application requirements may be found in the RFP. The application review process, conducted by staff members from MassCEC and the Massachusetts Department of Energy Resources (DOER), lasted from June through November 2017. Staff considered several factors, including project use cases and benefits, business models, and geographic diversity, during the review process. The State of Charge study recommended a variety of energy storage use cases for implementation across the Commonwealth, and the final ACES awardees covered eight of the ten recommended cases, as well as a new case, transit. Staff favored projects with many diverse benefits and value streams, both monetizable and non-monetizable, that benefit ratepayers, utilities, and/or bulk power systems. The 25 projects’ benefits range from cost reduction and load shifting to increased grid resiliency and greenhouse gas reductions. The ACES program aims to benefit the public through education of customers, utilities, consumers, policy makers and a variety of industry stakeholders on the benefits of energy storage and help de-risk investments in energy storage projects in the future. ACES projects demonstrate replicable business models and use cases. The awardees exhibit 9 different use cases, 8 of which were included in the State of Charge and 1 new use case, and 14 unique business models. Massachusetts’ ACES program promotes leadership and innovation in energy storage deployment and business model demonstration. ACES is the state’s first substantial investment in energy storage projects and is designed to significantly catalyze the market. While technology demonstration programs are common, this program is unique in its business model demonstration objectives. The replicability of each project was also considered in the selection process to ensure the success of the market. Many projects integrate other technologies with their storage projects to maximize the benefits. 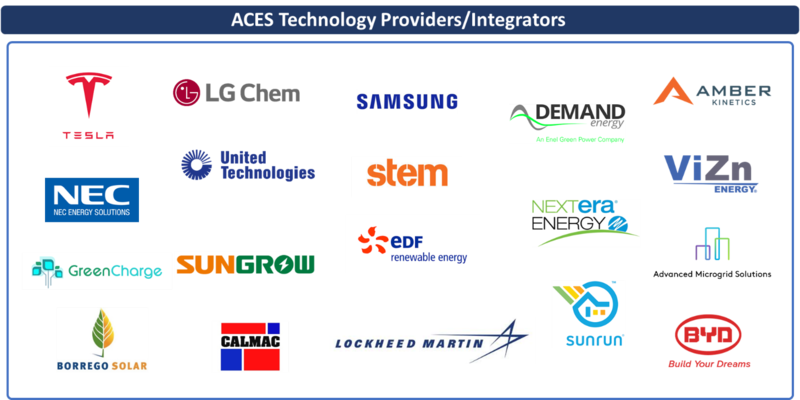 The complementary technologies included in the ACES projects consist of solar PV, demand management, wind, EV charging, gas plant, and combined heat and power. Awards sought to achieve geographic distribution.